An inspirational experience for people who want to create awareness through eco-tourism, research and community outreach. Whatever your background or profession, if you love marine wildlife and want to experience working with some of Southern Africa's most incredible species, this is the program for you. Volunteers enjoy fantastic accommodation, complete with swimming pool, high-end chalets, a bar area and numerous additional facilities. On this program, you will learn more about and have the opportunity to work with great white sharks, whales, dolphins, penguins and more. Expeditions are organised throughout the duration of your stay, ensuring that every one of our volunteers has the opportunity to experience all they can. 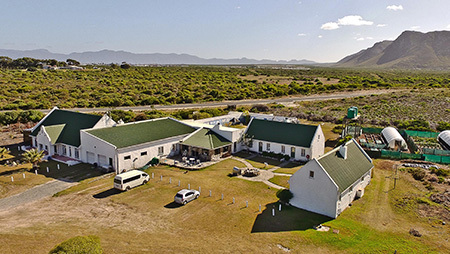 Gansbaai is home to The Marine Big 5, meaning you have the chance to both worth with and learn more about great white sharks, whales, dolphins, cape fur seals and the endangered african penguin. Marine Dynamics Academy has a fleet of vessels at its disposal, with many dedicated to eco-tourism. You'll spend most of your time working on these, helping guests learn more about african marine wildlife. Conservation and engaging with our local community is at the core of what we do. It's important to us that we give back and all volunteers are invited to come along to our outreach projects. Gansbaai is the great white shark capital of the world and also one of the best spots on the planet to go cage diving with these incredible apex predators. Welcome to the home of the great white shark. 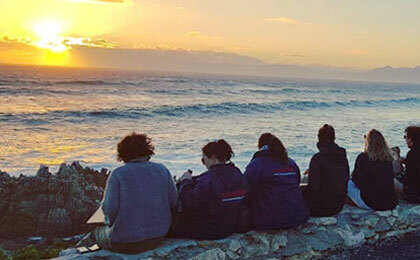 Our Marine Volunteers don't just live in South Africa, they experience the vibrant colours, beautiful sunrises, incredible sights and sounds every day from the moment they awaken. 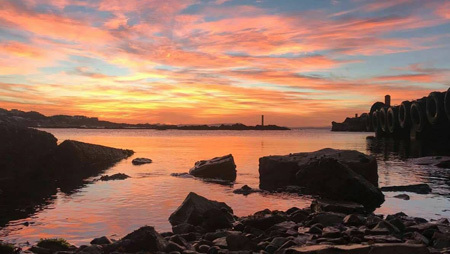 Gansbaai, South Africa is the only place on the planet where you have the chance to naturally find great white sharks, southern right whales, humpback dolphins, cape fur seals and the endangered african penguin. "This was hands down the most memorable and most amazing experience of my life!" I got to work closely with my absolute favorite animals (sharks) as well as the rest of the marine big 5. Words honestly cannot even begin to describe my love for this trip and the wonderful staff. Thank you for making my time in Gansbaai just so special! I would definitely recommend to every person on this earth. Accommodation is at the International Marine Volunteer Center. There are 4 cottages that accommodate up to 6 people per cottage. Each cottage has a bathroom, kitchenette and living area as well as daily living essentials. The main building has a beautiful kitchen, equipped with induction plates, a microwave and oven for cooking and a fully functional recycling system in place. The Great White House is the hub of the tourism activities. It is here that we brief our clients prior to each trip. This facility has a fully equipped restaurant and curio shop and two dedicated briefing rooms for clients, not to mention really great staff who make awesome coffee! There is also a Southern Right Whale skeleton hanging from the ceiling the largest privately owned exhibit in South Africa as well as two dolphin skeletons. Tea and coffee is freely available to volunteers. Research projects are done under the banner of the Dyer Island Conservation Trust. The Trust enjoys the sponsorship of Volkswagen South Africa who have donated the use of two vehicles as well as covered necessary research fuel costs and some branded items and children�s educational books. 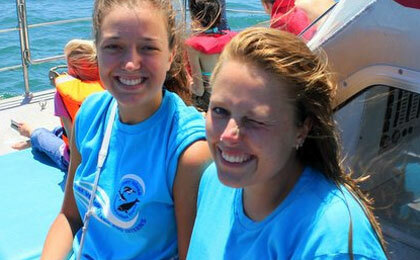 Marine Dynamics and Dyer Island Cruises actively do fundraising with their clients every day. Your participation in the programme also helps to support our research and conservation work, both in-kind and financially - if you stay for four weeks or more then a donation will be made on your behalf to the Trust. 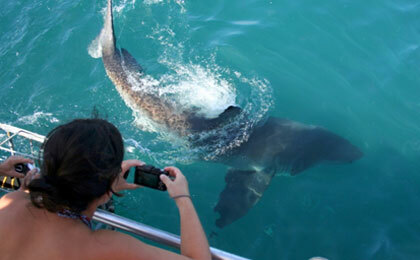 Our research and the comparatively easy and predictable access to Great White Sharks attracts international attention. Our boats regularly host visiting international scientists and camera crews from the US, Europe and Asia with resulting documentaries being broadcast on the BBC, National Geographic Discovery and other well-respected documentary channels. More detailed information and blogs can be read at www.dict.org.za. Our volunteers undertake sea based activities across several vessels, each dedicated to a very specific task. 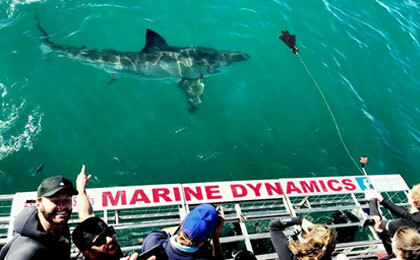 Whether great white shark cage diving, pelagic bird watching, whale watching or marine research, Marine Dynamics Academy offers you an experience you won't forget. We've no doubt you have several questions about the Marine Volunteers program, many of which can be answered here. 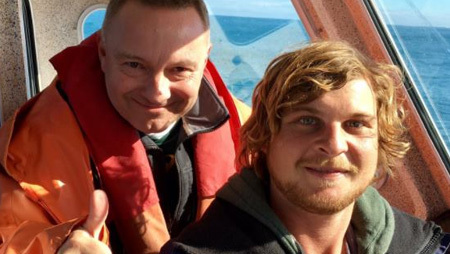 Visit the Marine Volunteers blog for all the latest updates, including blogs written by the students themselves. 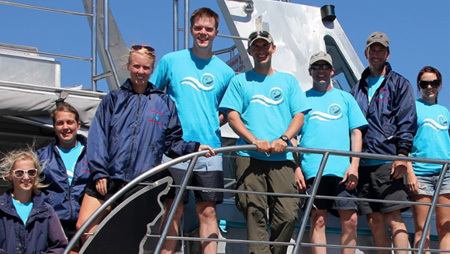 You can apply to Marine Volunteers online. Simply follow the link below to complete a short online form and our team will be in touch. The home of the Marine Big 5.